It's well known that mammography alone leaves much to be desired when screening patients with dense breasts, but for those patients new research suggests a unique ultrasound solution from GE Healthcare may offer considerable benefits. Automated Breast Ultrasound (ABUS) distinguishes cancer by dark areas in dense breasts on an ultrasound, as opposed to the all-white contrast in digital mammography â which has been described by radiologists as "like trying to find a snowball in a snowstorm." In an analysis entitled the European Asymptomatic Screening Study, 1,668 women between the ages of 40-74 were evaluated with ABUS in a 15-minute exam after undergoing digital mammography screening. The results showed a 57 percent relative increase in cancer detection. 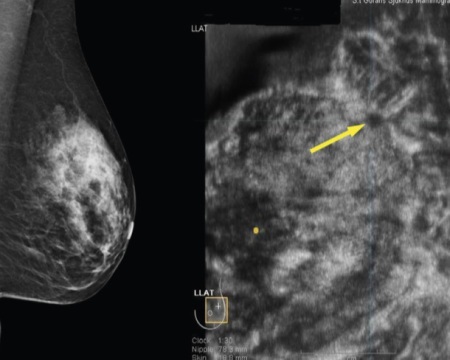 "It provides amazing information that is not seen on regular hands-on ultrasound," Dr. Brigitte Wilczek, M.D., Ph.D., chief doctor for the Mammography Department at Saint Goran's Hospital in Stockholm, Sweden and lead researcher, told HCB News. "We know that screening could be improved by using additive tools in dense breasts. ABUS is such a very appealing tool. In our study it was possible to implement to our service screening, increasing cancer detection and maintaining a very acceptable recall rate." The findings were equivalent to 6.6 cancers detected per 1,000 women, compared with 4.2 percent of those who received mammography alone. "The two technologies are very complementary," said Wilczek. She also noted that ABUS helps achieve a lower recall rate among screening patients. European guidelines allow a range of three to five percent; the ABUS patient population required just less than one percent recall. Specifically, a total of 23 women required recall for further testing with mammography alone. Of the patients who received the supplemental ABUS exam, 15 women required recall and eight women avoided recall for further testing. The ABUS, said Wilczek, results in fewer false positives which "means we do not have to worry as many women." The results were recently published in the European Journal of Radiology. The newest generation of GE Healthcare's Invenia ABUS system was showcased at the European Society of Breast Imaging in Paris at the end of September.